We are honored to receive this year's New Development Project of the Year award on our recently completed project, The BB&T Leadership Institute. 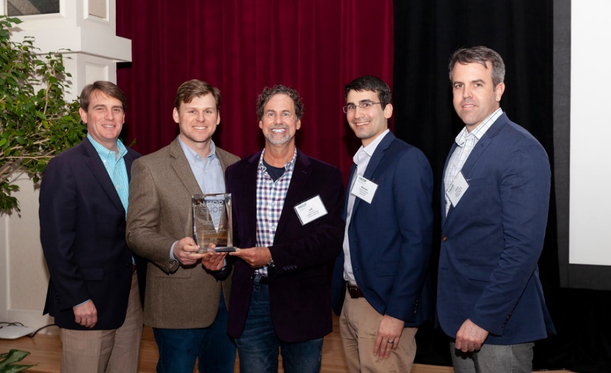 Shown here, Blum Construction's Josh Cook and Mark Dunnagan join CJMW Architecture in accepting the award at this year's NAIOP NC Statewide Conference. The Leadership Institute provides development programs for corporate executives, business owners, BB&T clients and educational leaders. The 3 floor, 58,000 square foot facility sits on 11 acres adjacent to BB&T’s Triad Corporate Center in Greensboro, NC. The project features rustic lodge ambiance nestled in a wooded environment with great care taken to minimize the disruption of the natural setting. The building is separated into 3 distinct parts: a corporate training and conference center, and two, 3-story hotel wings for overnight accommodations. Blum worked tirelessly with the design team to achieve BB&T’s desired budget and schedule, which will allow the facility to open for business in the spring of 2018. The project team utilized a “fast track” design and construction delivery to achieve these goals. Read more about this award on NAIOP's website.